Arthur Rowledge was one of the most prolific designers of piston aircraft engine in history. In 1913 he joined Napier & Son where he designed the firm’s first aircraft engine, the Lion, in 1917. This engine went on to achieve great success and was even used during World War II, but Rowledge moved on to Rolls-Royce (R-R) in 1921. While at R-R, Rowledge was very involved with the Condor III, Kestrel, “R” Schneider, and Merlin engines. Rowledge also designed the air-cooled and sleeve-valve Exe and Pennine engines. These two engines were quite a departure from standard R-R practice and never made it to production status. Side view of the Rolls-Royce Exe engine. The cylinder baffling in the image is of a simple construction when compare to the other engine image below. It appears to be the same baffling as seen on the engine installed in the Battle. In the 1930s Rowledge became seriously ill and took a leave from R-R. During his recovery, R-R decided not to bring him back to the main engine development programs but to give him complete control of designing a new engine. This new engine was based on a 1,000 hp (746 kW) requirement from the Fleet Air Arm for shipboard aircraft use where air-cooling was preferred. The new engine was sanctioned in February 1935 and originally called Boreas, but the name was later changed to Exe. 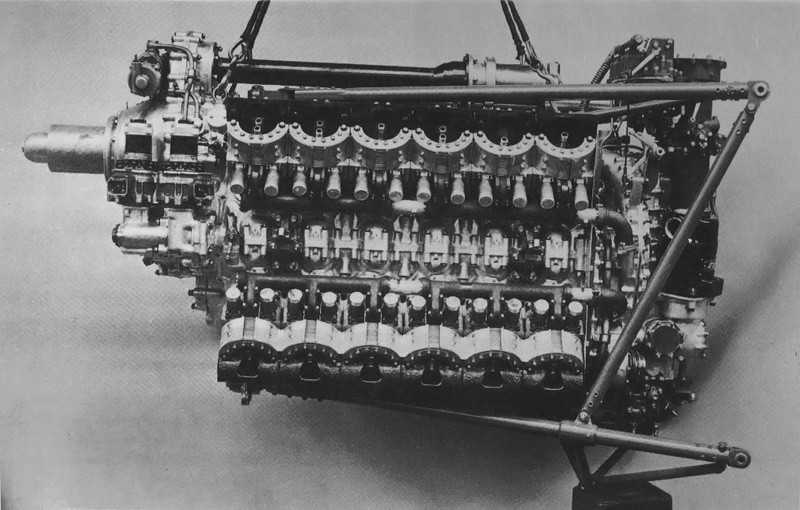 The Exe engine had four banks of six cylinders in an X configuration. Each bank was 90 degrees from the next. The cylinders had a 4.225 in (107.3 mm) bore and 4.0 in (101.6 mm) stroke, for a total displacement of 1,346 cu in (22.1 L). The Exe had a two-speed, single-stage supercharger, and the compression ratio was 8 to 1. The engine weighed 1,530 lb (694 kg). The two spark plugs for each cylinder were fired by coil ignition rather than standard magnetos. A 0.358 gear reduction to the propeller was achieved through spur gears; their arrangement elevated the propeller shaft centerline above the crankshaft. Clear view of the Rolls-Royce Exe and the baffling around each cylinder to direct air for proper cooling. The baffling appears to be an updated version compared to the image above. Also note how the spur reduction gear has elevated the propeller thrust line. The sleeve-valves, undoubtedly inspired by Harry Ricardo, followed the established Burt-McCollum/Bristol practice. Each cylinder barrel had three intake ports and two exhaust ports. The sleeve itself had only four ports, one was shared as an intake and exhaust port. The drive cranks for the sleeve valves were driven via spiral gears from a shaft that ran along each side of the engine. A.A. Rubbra states that these shafts were driven from the propeller gear reduction. The single sleeve for each cylinder was sealed by the use of a junk head. The entire system proved to be quite reliable. The connecting rods consisted of one master rod and three articulating rods. The big end was essentially a square with the master rod extending from one corner and the three articulated rods attached to each of the other corners. The big end was split and bolted together around the crankshaft via four bolts. A specialized pressure air-cooling method was used. Cooling air entered the engine cowling below the spinner. The air was then fed into the upper and lower Vees. Baffles attached to the individual cylinders caught and directed the air through the cylinder’s cooling fins. The air passed from the upper and lower Vees into the side Vees and exited toward the rear of the engine cowling. Reportedly, the arrangement worked very well with minimal drag and no cooling issues. Induction manifolds delivered the air/fuel mixture to the cylinders through the top and bottom Vees. Exhaust from the cylinders was collected in manifolds on the side Vees. A great image of the Exe installed in the Battle with the cowling removed. Note early version of the cylinder baffling. The Exe was originally rated at 920 hp (686 kW) at 3,800 rpm. The engine was first run in September 1936, and it had completed a 40-hour development test by the end of 1937. The Exe first took to the air in a modified Fairey Battle (K9222) on 30 November 1938. This particular aircraft was owned by R-R and was modified at the R-R Flight Development Establishment at Hucknell. Exe engine development continued with very little trouble; however, the engine did suffer from excessive oil consumption. Ultimately the engine’s output was increased to 1,200 hp (895 kW) at 4,200 rpm, and continued development to 1,500 hp (1,119 kW) was planned. A liquid-cooled version of the engine was also studied. 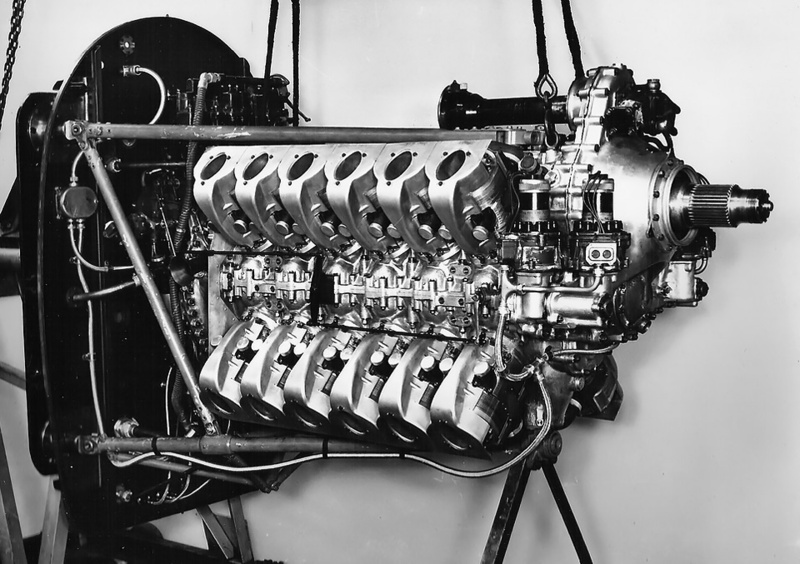 A four cylinder test engine representing an X configuration was run in 1938. Each cylinder of the test engine had its own steel water jacket. The program progressed, and a complete liquid-cooled X-24 engine was built; this engine featured normal cast aluminum cylinder blocks with integral water jackets. Reportedly, this engine was run and tested but never flew. 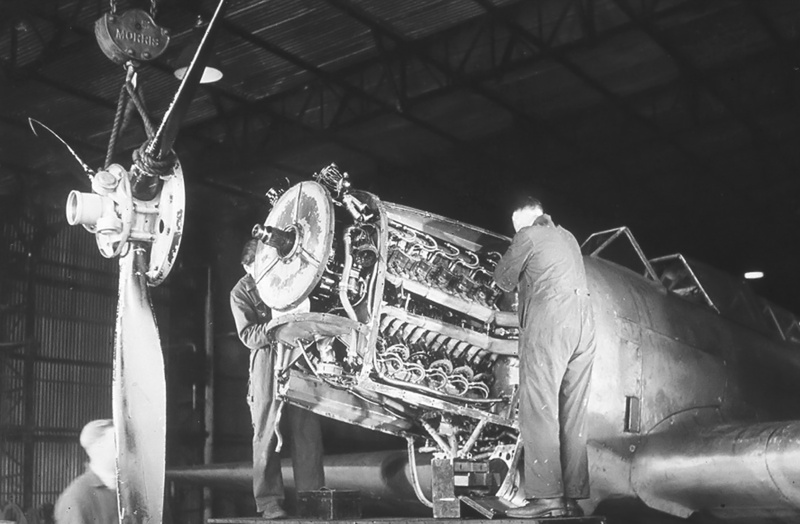 Rolls-Royce Exe installed in Fairey Battle K9222. Note the cooling air intake under the spinner and exit by the exhaust stacks. The Exe-powered Battle continued to fly long after the engine was cancelled. The Exe was originally intended to power the Fairey Barracuda torpedo-bomber and the production Fairey F.C.1 four-engine transport. 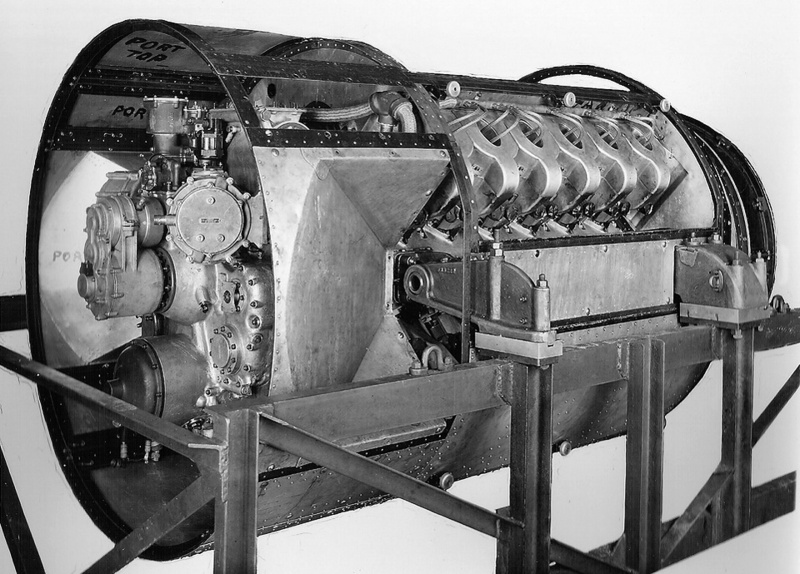 With the start of World War II, top priority was given to developing and producing Merlin and Griffon engines. Ernest Hives, R-R General Works Manager, estimated that building 275 Exe engines would be the production equivalent of 1,200 Merlins. At his request, work on the Exe program was suspended in September 1939 and stopped completely by 1941. Development was also discontinued on the liquid-cooled engine. The Barracuda was switched to Merlin power, and the F.C.1 was never built. As an indicator of the engine’s sound design and reliability, the Exe-powered Battle continued to fly until 1943, long after the Exe program was cancelled. In addition, R-R’s Exe-powered Battle flew at higher speeds than the standard Merlin-powered Battles. The encouraging results from the Exe compelled a small design team to continue work on the air-cooled, sleeve-valve engine concept. Around June 1943, design work was accepted on what was essentially an enlarged Exe. The new engine project was known as the Pennine and was headed by Dr. Sprinto Viale. Rolls-Royce Pennine engine shown without any exhaust stacks or spark plug leads. The cylinders look very similar to those used by Bristol. The ring of studs around the propeller shaft is where the annular cooling fan would attach. The Pennine had the same layout as the Exe, with the exception of the propeller gear reduction. Rather than spur gears, which would raise the propeller shaft as on the Exe, the Pennine used epicyclic (planetary) gears that allowed the propeller shaft to be in-line with the crankshaft. A propeller gear reduction of .3 or .4 was used. In addition, an annular cooling fan was driven from the gear reduction at 1.03 times crankshaft speed. Illustrations done by Lyndon Jones show the drive shafts for the sleeve valves geared to the rear of the crankshaft rather than to the gear reduction. It is possible this deviation from the Exe’s design was a result of the aforementioned changes to the gear reduction. 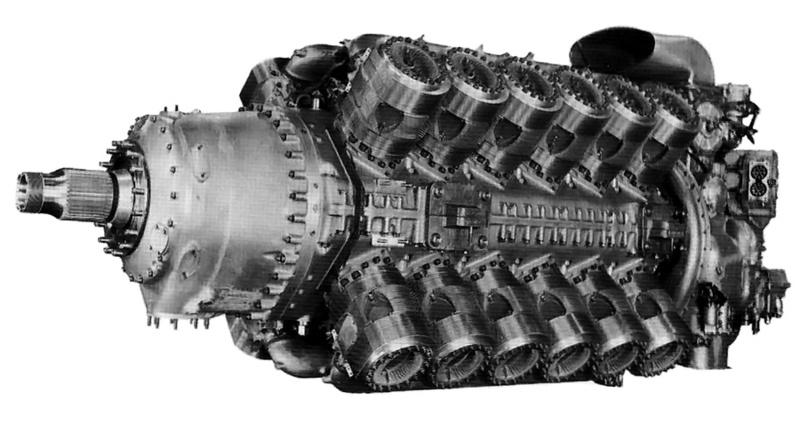 Design work on the engine was completed by September 1944. Another change from the Exe that can be seen in the Jones illustration was the connecting rod arrangement. Rather than having a split big end, the Pennine utilized a one piece master connecting rod with three articulated rods. The crankshaft’s crankpins were bolted together through the one piece master rods. The Pennine engine had a 5.4 in (137.2 mm) bore and 5.08 in (129 mm) stroke, giving a total displacement of 2,792 cu in (45.8 L); this was over twice the displacement of the Exe. With a dry weight of 2,850 lb (1,293 kg), the Pennine was 106 in (2.69 m) long, 37.5 in (.95 m) tall, and 39 in (.99 m) wide. The engine was equipped with a single stage, two speed supercharger that provided 12 psi (.83 bar) of boost at takeoff and combat power settings. The Pennine developed 2,750 hp (2,051 kW) at 3,500 rpm at sea-level and up to 2,800 hp (2,088 kW) under combat settings. A reliable 3,000 hp (2,237 kW) was thought to be easily obtainable with further development. Pennine sectional view from Sectioned Drawings of Piston Aero Engines* by Lyndon Jones. Note the annular fan and sleeve valve drives. Only one or two Pennine test engines were built; the first was finished on 31 December 1944. The engine was run on teststands during 1945, and an engine cowling was developed to maximize the efficiently of the pressurized air-cooling. While the engine ran well, the end of piston-powered military aircraft and civil airliners was on the horizon, with piston engines being supplanted by jet engines. Possible applications for the Pennine engine were the Fairey Spearfish torpedo bomber and the Miles X.11 airliner. Ultimately, the Spearfish was powered by a Bristol Centaurus. The Miles aircraft lost out to the Bristol Brabazon and was never built. Development of the Pennine was stopped in mid to late 1945. A further engine study was made where two 16-cylinder power sections (using Pennine cylinders) of an X configuration were attached to a common crankcase. This arrangement made an X-32 engine and was known as the Snowden. A shaft from the midsection, between the two X-16 power sections, was to travel forward along the top and bottom Vees of the engine to a gear reduction that drove half of a coaxial contra-rotating propeller unit. 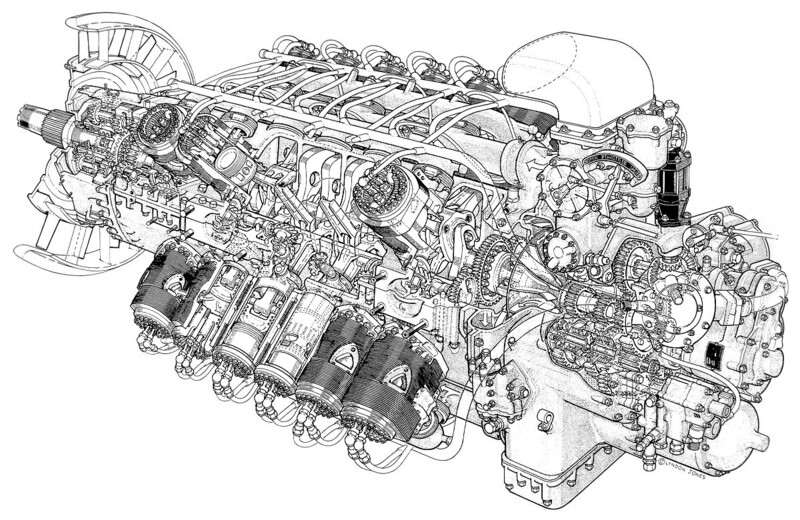 This engine would have displaced 3,723 cu in (61.0 L) and produced 4,000 hp (2,983 kW). Some testing was done, but a complete engine was never built. Rear view of the Pennine engine and cowling. Note the baffling for each individual cylinder and the circular front of the cowling for the annular cooling fan..
*Rolls-Royce Heritage Trust books that are currently in print and available from the Rolls-Royce Heritage Trust site. This entry was posted in Aircraft Engines, World War II on 23 November 2012 by William Pearce.